Wm. Ascot are hand-rolled premium cigars wrapped in natural Ecuadorian tobacco leaves. Each of these cigars are handmade in the Dominican Republic, individually crafted and fused with binders and filler tobaccos from the Dominican and Honduras regions. Wm. 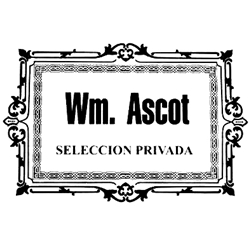 Ascot cigars are offered in the Churchill size with tobacco wrappers of two unique styles, a natural Ecuadorian Sumatra or a dark silky Maduro Connecticut Broadleaf. Mild to medium in strength, these premium cigars produce a mild and creamy smoke for the naturals, and a flavorful chocolate, and spicy smoke in the Maduro. The Wm. Ascot line are hand-rolled premium cigars that make an excellent choice for any cigar connoisseur looking for a perfect way to unwind and relax with a quality cigar that produces a smooth and easy smoke. Smokers Discounts has made it easy and affordable to buy high-quality handmade cigars online. Every product can be delivered right to your doorstep. A variety of sizes and flavors are listed below at our discount online cigar store. Each of these styles are in stock and available. Call us for more details!